From the serene islands of Halong Bay to the once-forgotten temples of Angkor Wat, the wonders of Indochina are well known, yet there are still plenty of hidden gems waiting to be uncovered. With three remarkable countries together in one great-value package, this comprehensive tour through Vietnam and Cambodia, followed by a stopover in Singapore, will be truly awe-inspiring! Three countries, 21 days, one unforgettable adventure. Sail among the magical limestone islands of Halong Bay aboard a traditional Vietnamese junk boat; wander scenic rice terraces and ethnic villages hidden in the mountains of Sapa; and get lost among the vibrant streets of Hanoi, Hoi An and Ho Chi Minh City. Journey through the stunning countryside of Cambodia to Phnom Penh and Siem Reap; explore the ancient temples of Angkor Wat and Angkor Thom; and enjoy a two-night stopover in the exotic cultural melting pot of Singapore. This fabulous tour includes return flights, 19 nights hotel accommodation, an overnight junk cruise and so much more! 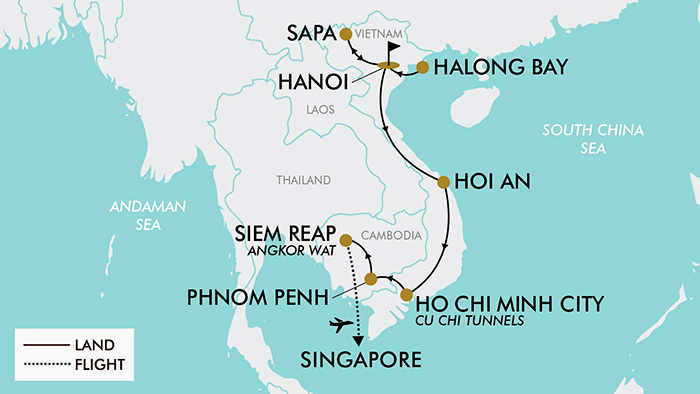 Today depart from either Sydney, Melbourne, Brisbane, Adelaide or Perth for your flight to Hanoi, Vietnam with award winning Singapore Airlines. On arrival you will be picked up by a tour representative transferred to the hotel. Please note: due to flight scheduling and availability, some departures may occur on day 0. Affected customers must be at the airport the night before. Flight times will be indicated on your final documentation which you will receive prior to departure. This morning after breakfast drive through beautiful green rice paddy fields on the way to the coast (approx. 4 hours) where you will board a Junk boat for an overnight cruise through the thousands of towering limestone islands and emerald waters of UNESCO listed Halong Bay. Enjoy a seafood lunch before taking part in some afternoon activities such as swimming, relaxing on a remote beach, climbing to the top of a lookout for an amazing panoramic view or take a ride on a rowing boat into a secluded bay. Also cruise further into the bay to visit a Pearl Farm. Drop anchor in the late evening for an overnight stay among the dramatic limestone peaks rising out of the sea. Early risers can take part in an optional Tai Chi class on deck this morning. After breakfast climb aboard the tender for a visit to Sung Sot (Surprise) Cave, a colourful grotto of giant stalactites and stalagmites. Return to the boat and enjoy a short cooking class where you will learn to prepare local delicacies such as spring rolls. Enjoy lunch on board, followed by a relaxing trip back in to port, where you will disembark and return back to Hanoi by bus (approx. 4 hours). Enjoy the rest of the day at leisure. Today is free at leisure to explore Hanoi or you can take the opportunity to take part in an optional tour. This morning you will be met at the hotel by the guide and driven to the historic complex of Ba Dinh where you will visit Ba Dinh Square. Afterwards continue onwards to Ho Chi Minh’s Mausoleum and the One Pillar Pagoda. A must-see monument in Hanoi, an ancient Buddhist pagoda supported by only one pillar. Built in the early 11th century during the reign of King Ly Thai Tong it resembles a lotus blossom. Afterwards visit Van Mieu - Quoc Tu Giam (the Temple of Literature), the first Imperial school in Vietnam built in 1070 during the dynasty of King Ly. Enjoy lunch at a local restaurant then after lunch visit the complex at Hoan Kiem Lake. Here you will see Ngoc Son Temple (Jade Mountain Temple), But Tower (pen shaped tower), Dai Stand and The Huc Bridge (wooden bridge painted in red). Afterwards enjoy a water puppet show, which is an impressive cultural example of Vietnam's thriving arts scene. To conclude your tour enjoy a cyclo (pedicab) ride back to your hotel this evening. Inclusions: Transfers from hotel, English speaking guide, lunch, entrance fees, water puppet show and cyclo ride. Depart early this morning after breakfast for the mountainous market town of Sapa in the North West of the country (approx. 5 hours). Sapa is a picturesque town located in the Hoàng Liên Son Mountains in Northwestern Vietnam. A popular trekking base, it overlooks the Muong Hoa Valley. Hill tribes and ethnic minorities, such as the H’Mong, Tay and Dao make up much of the town's local population. This afternoon take the opportunity to walk through the tiered rice paddy fields to Ta Van village to learn about the local ‘Zay’ people. The walk is of basic/moderate difficulty (approx. 7km) along well formed trails and cobbled steps. Please note: the terrain on this walk is undulating but has no demanding ascents or descents. Alternatively, choose to enjoy the afternoon at leisure to discover the town of Sapa. After breakfast, begin another walking journey with a visit to two villages of the H’Mong people (Catcat and SinChai). Continue your walk to see the impressive Thac Bac (Silver) Waterfall and a hydroelectric power station established during the French occupation. Take in stunning landscapes of green forests and rice fields on the walk back to Sapa. Today's walk is of basic/moderate difficulty (approx. 7km) along well formed trails and cobbled steps. Please note: the terrain on this walk is undulating but has no demanding ascents or descents. Another option to the full day walk, you can drive to the base of the villages (Catcat and SinChai) and walk (approx. 3km) down to the village centres. The H'Mong/Mong is an indigenous people in Asia. The H’Mong began a gradual southward migration from China in the 18th century due to political unrest and to escape Chinese threats. They are one of the largest ethnic minorities in Vietnam. Alternatively, you can choose to enjoy the day at leisure in Sapa. Today is spent at leisure in Sapa before transferring back to Hanoi in the afternoon (approx. 5 hours) arriving at the hotel in the evening. This morning after breakfast you will be transferred to the airport for your flight to Da Nang (approx. 1.5 hour flight). Upon arrival you will drive onwards to the ancient coastal city of Hoi An (approx. 1 hour). Upon arrival check-in to the hotel. The rest of the afternoon is spent at leisure to explore this amazing city. Depart early this morning and travel to My Son (approx. 1 hour), a UNESCO World Heritage site located 40km southwest of Hoi An. My Son was once the capital and religious centre of the Cham people and is believed to be the longest inhabited archaeological site in Indochina. The ruins of My Son were built between the 7th to 13th century BC and are located in a valley surrounded by mountains, the sides of which are covered in thick jungle. Hon Quap (Cat's Tooth Mountain) overlooks the site, its crooked peak mimicked by the architecture of some temples' roofs. These mountains are the source of the Thu Bon River, a holy river which flows through the site. Enjoy lunch at one of the local restaurants (not included) and after the day’s tour of this magnificent site be transferred back to the hotel in Hoi An. Today is free at leisure to explore the ancient city of Hoi An. Today enjoy a relaxing morning before transferring to Da Nang airport around midday to fly onwards to Ho Chi Minh City (formerly Saigon) in the south of Vietnam (approx. 1 hour flight). Upon arrival transfer to the hotel and enjoy the rest of the day at leisure. This morning you will be picked up from your hotel after breakfast for a full day tour of the famous Cu Chi Tunnels (approx. 1 hour distance each way). The Cu Chi Tunnels were constructed by Vietnamese fighters during the country’s long fight for independence. The network of tunnels which make up this underground city include living rooms, kitchens, hospitals, weapons factories, storage facilities and a command centre. The tunnel system was an excellent way for the Vietcong to move around the countryside undetected by foreign troops and was at one stage home to around 10,000 people. After exploring these tunnels along with nearby remains of American tanks and numerous bomb craters. From here, you will drive back to Ho Chi Minh City arriving in the mid afternoon. The rest of the evening will be spent at leisure. Today is spent at leisure, or alternatively take part in an optional activity. This morning after breakfast be picked up from the hotel and travel to the city of My Tho (approx. 1.5 hours) on the banks of the Mekong. Upon arrival board a motor boat and cruise along the Mekong River. The boat will take you to Xep Canal, where you will transfer to smaller canoes so you may navigate the smaller canals. These canals are lovely places where you can escape the traffic of the main river. Here you will cruise under coconut trees before arriving at a small islet. Disembark and walk around a small local village. Stop at a local family's home to enjoy tropical fruit, honey tea and wine and listen to traditional Vietnamese music performed by the villagers. Afterwards continue onwards to another islet where a traditional Vietnamese lunch will be prepared by a local family (included). In the afternoon return to Ho Chi Minh City and your hotel accommodation. Inclusions: Transfers to and from the hotel, English speaking tour guide, Mekong River boat trip, lunch, honey tea and honey wine, seasonal fruits and a traditional music performance. Today early in the morning you will be picked up at the hotel to begin your journey to Phnom Penh, Cambodia by way of a tourist bus (not a private group service). Stop at the Vietnam/Cambodia Moc Bai Bavet border for visa processing (visa cost not included) and then continue onwards to Phnom Penh. This journey can take anywhere between 6 to 8 hours depending on the visa processing times on the border. On arrival, be welcomed by the tour guide and transfer to the hotel. The afternoon is free to spend relaxing or exploring Phnom Penh. - For customers who would prefer to fly to Phnom Penh rather than take the tourist bus, a flight upgrade option is available for $220 per person which includes an afternoon flight from Ho Chi Minh City and airport transfers in Ho Chi Minh City and Phnom Penh. - Flights are subject to schedule changes and/or delays and may not always arrive in Phnom Penh before the bus. Today is free at leisure to explore the capital city of Cambodia. After breakfast you will be picked up from the hotel to explore the capital city with the bustling Central Market, the Independence Monument, Wat Ounalom. After a set lunch at a local restaurant continue on to the Tuol Sleng Prison Museum and the notorious “Killing Fields” of Choeung Ek, gaining a deep Insight into the painful rule of the Khmer Rouge. Afterwards you will visit the Royal Palace and the sacred Silver Pagoda, which is well known for its 5000 silver tiled floor. Upon completion of the tour you will be transferred back to your hotel. Inclusions: Transfers to and from the hotel, English speaking tour guide and a local lunch. After an early breakfast at the hotel travel to Siem Reap by bus (approx. 6 hours) passing through three provinces, Kandal, Kampong Cham and KamPong Thom. On arrival be greeted by a tour guide in Siem Reap and transferred to the hotel for an afternoon at leisure. After breakfast at the hotel you will begin your full day tour to Angkor Wat, the most balanced, the most harmonious and the most perfect Khmer temple. It shows Khmer art, which reached the height of its glory in the 12th century. See the south gate of Angkor Thom, then visit the Terrace of Elephants, which used to be a base for the king’s grand audience hall. The Terrace of the Leper king was a terrace which housed the royal crematory. Continue onto visit an amazing view of Ta Prohm Temple which has been deliberately left as it was discovered. Enjoy a set lunch at a local restaurant before visiting Pre Rup Temple, a classic example of temple-mountain; Eastern Mebon, Ta Som, Neak Pean, a unique ancient hospital built in the reign of King Jayavarman VI (1181-1220); and Preah Khan, a large temple built on the site of a battle that ended in Angkor’s downfall at the land of the Cham. After the tour you will be transferred back to the hotel for an evening of leisure. Today is free at leisure to explore or relax in this beautiful city. Today is the last day in Cambodia! You will be picked up from the hotel and transferred to the airport for your onwards flight to Singapore. A packed breakfast will be provided for travellers with an early departure. Upon arrival into Singapore you will meet a representative from Singapore Airlines holding a sign who will take you to the Singapore Stopover Holiday counter. Here your transfers and hotel accommodation will be arranged for your 2 night stopover. Today is free at leisure to explore Singapore. Today you will be transferred to Singapore Airport for your return flight back to Australia. *Please note, some flights may arrive in Australia +1 day later. Travel offer is valid for travel on selected dates until the 25th December 2019.
International Flight: Singapore Airlines plus any codeshare partners (subject to availability). Domestic Flights: Vietnam Airlines and Vietjet Air (subject availability). - Business Class: Buy now for $3499 per person. 2 x Single or 1 x Queen/King (subject to availability). - Recommended gratuities/tipping: $10 AUD per person per day, which will be collected whilst on tour. Vietnam's climate can be divided into a tropical and a temperate zone. It is characterized by strong monsoon influences, has a considerable amount of sun, a high rate of rainfall, and high humidity. July is the hottest month in Hanoi with an average temperature of 29°C and the coldest is January at 17°C with the most daily sunshine hours at 8 in July. Cambodia is warm to hot year round and the climate is dominated by the annual monsoon cycle with its alternating wet and dry seasons. April is the hottest month in Phnom Penh with an average temperature of 31°C and the coldest is January at 26°C with the most daily sunshine hours at 8 in December. The island does not have clear-cut seasons like summer, spring, autumn and winter. The weather is warm and humid all year round. Rainfall is almost an everyday phenomenon, even during the non-monsoon period. February is the hottest month in Singapore with an average temperature of 27°C and the coldest is January at 26°C with the most daily sunshine hours at 9 in September. Please note: a general level of fitness will be required. If you will be participating in the walks on days 4 & 5 a moderate level of fitness is recommended (walking on uneven trails up to 3km in length). If you have any concerns please consult your healthcare provider prior to purchase/travel. From December 2017, Australians are eligible to apply online for a single entry electronic visa (e-visa), valid for up to a maximum of 30 days. Lodge your application online (for a non-refundable fee) with the Vietnamese National Web Portal of Immigration - https://www.xuatnhapcanh.gov.vn/. You will be given a unique code to track your visa application status. Once your visa is granted, you must print it out and present it at check in. Keep this e-visa print out with you at all times during your travel in Vietnam. Alternatively, you can start your Visa application process once you receive your final travel documentation approximately 6 weeks prior to departure. - The visa will be completely arranged on arrival at the border for $35 USD per person. - Visas must be arranged in USD currency at the border with 2 passport size photos. A tourist visa is not required for Singapore if travelling on an Australian passport.